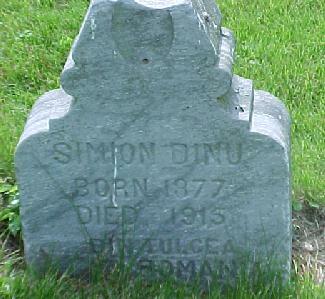 (or "Northern Indiana Hospital Cemetery). NW 1/4, section 34, Township 27 North, Range 1 East, (of second Indiana principal Meridian), in northeastern Clinton Township, Cass County, Indiana, Immediately south of the east-and-west "River Road" (an extension westward of Logansport's "Cliff Drive") which runs along the south bank of Wabash River; and immediately East of a now abandoned (and closed) former north-and-south road once commonly known as "Lovers Lane". (On the face of this unusual-looking monument is a circular depression, which is said to have contained a picture of the deceased clad in, one man tells me, Romanian Military uniform. Wm. Carney Born 1850 Died 1929. See Separate Report for the old (or earlier) Longcliff (Logansport State Hospital) Cemetery, and also separate reports for Neff and Young (or Young - Shanklin) cemeteries. L'Anguille Valley Memorial Association Logansport, Indiana transcribed in 2007 by Rebecca Miller for the Cass County INGenWeb Project. Here are 40 - 50 markers engraved with names and dates, but just piled in the corner of the cemetery. Most of these appear to be from the 1920s and 1930s. In the background you can see the State Hospital. 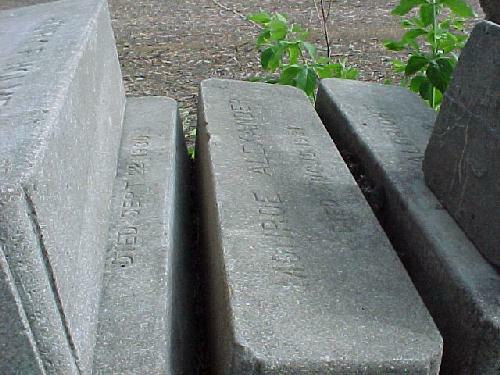 Most grave markers, like this one, at the Logansport State Hospital are intended to be level with the ground. 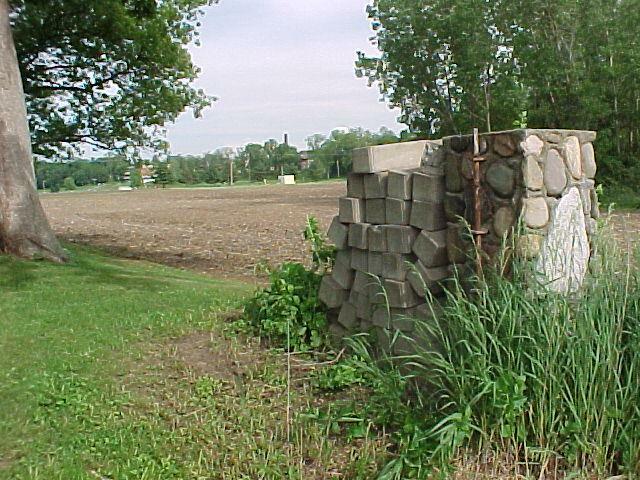 The first or original, and former (now Long-abandoned and practically forgotten) patient's cemetery at Logansport State Hospital at Longcliff, Clinton Township, Cass County, Indiana. This cemetery does not seem to appear on any or even the older maps or plats of this region; but fieldwork-observations, coupled with study of modern maps and also aerial photographs, seems to indicate that it is in N. W. 1/4 of S. W. 1/4 of FRACTIONAL SECTON 34 T 27 N, R 1 E, 2 p.m. Indiana. it is 1 /14 miles west of Logansport's (Shultztown's) West st.
Report by R. B. Whitsett, Jr., Chairman, L'Anguille Valley Memorial, Association's Committee on Cemetery Research, 500 Front St., Logansport, Ind. The large (two-thousand-patient) institution now known as "Logansport State Hospital," First opened its doors (for the receipt of patients on July 1, 1888, more than half a century ago. With the first patient who died (following the opening of the Hospital), we are not here concerned. Two months elapsed before any patient died whose remains were not removed by his relatives or friends: ---- On Sept 3, 1888, occurred the death of Mr. Jacob Lang, aged 41, who had been a farmer in the Mt. Vernon vicinity of Posey County, in the extreme Southwest corner of Indiana, and who had been enrolled --- on Aug 21, 1888 as "patient no 195." It is doubtful whether embalming was practiced at so early a date, and perhaps partly because it did not seem very practicable in such hot weather, to ship a body ------ packed in ice ---- so great a distance and into a distance and into a region which presumably had few if any railroads, the Posey County Clerk seems to have directed, or recommended, that interment be made on the Hospital Grounds. Although the late Cass County Historian, the ubiquitous Dr. J. Z. Powell, ----- Himself a Logansport physician who often visited this hospital ---- seems somehow to have gotten hold of and examined some records concerning this old Hospital Cemetery (records which now unfortunately seem to be destroyed or lost), he seems to have been uninformed --- except in a very general way ---- as to the cemetery's location. Because all the monuments and other markers, the fence and certain other landmarks have long since entirely disappeared ( following the cemetery's abandonment in 1890. And because the hospital's grounds have expanded enormously, and undergone radical changes, during the past half century, changes which have confused or bewildered many of even the oldest of the region's " old-timers," the present writer found it exceedingly difficult to locate this cemetery at all. Connecting the River Road ("Cuff Drive") with the likewise East-and-West- Running Murphy (or "Back") Road, There formerly was a North-And-South public highway known, in this Clinton Township region, as "the lovers lane road," which has long been closed, and abandoned, and is now almost forgotten but the route of which can still be detected (though now over grown with grass where not converted into cultivated fields), and can even be followed, --- that is by anyone armed with a written permit, and not averse to climbing a number of barbed-wire (and other) fences and wading through one swamp and also one fair-sized creek, and climbing a long and rather steep hill or two. Like the new (or present) hospital cemetery, the older (1888 - 1891) one lies immediately east of this old "Lovers lane" route; but unlike the new cemetery, which is in the bottomlands ( and immediately south of the River Road), the older cemetery is at the very highest point between the River Road and the Murphy Road, it is 27/100 miles (more than 1/4 mile) south of the "River Road" and about 2/5 mile North of the Murphy Road. It is in the extreme South-West corner of a small and open but rough-surfaced, woods, which is on a sort of plateau lying south and also west of the hollow of the Longcliff Creek. 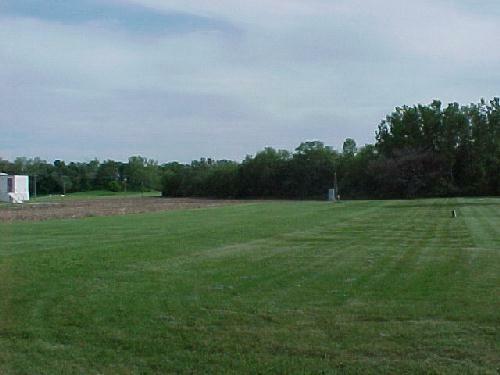 It is immediately North of the Northwest corner of a 4-acre field (now a meadow). Though containing today no monuments nor other grave-markers of any sort. This little cemetery was finally successfully searched out for, and obligingly pointed out to, the writer by the venerable Mr. Gus Minx, one of the exceedingly few members of the hospital-staff whose tenure goes back to this institution's early days. The spot he designates conforms with oral testimony of three or four other persons (who, however because of advanced age and health, etc... were unable to visit this not-very-easily-accessible spot); and is further confirmed by the present writer's finding more than a dozen easily over looked but unmistakable (sunken) graves, and some rusted fragments of wire nailed to certain trees (which seem to have served as fence-posts). Also there is here some suggestion of at least a few possible disinterments, but of many years ago. 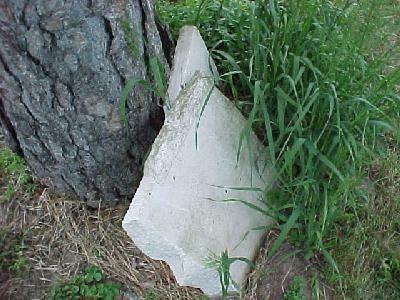 Also, in exploring the tall grass or weed-covered site (in quest of fallen tombstones), the writer found one fallen fence-post, to which are likewise attached pieces of rusted wire-fencing. Also, a few smooth fragments of what may be (but might not be) old slab-tombstones (now missing). This old (or original) Longcliff cemetery was entirely abandoned in 1891, three years after its establishment;-and abandoned for the seemingly good (and entirely sufficient) reason that workmen, in digging graves, increasingly complained of striking solid limestone (or other rock) only a few feet beneath the surface of the ground. The present (1940) hospital staff seems unable at this late date to locate any plat or other record concerning this particular very old cemetery (though finding seemingly complete records and plats of the 1891 cemetery which supplanted it); and tediously searching through their hundreds of old (multi-paged!) 1888-91 "patient records" (all in longhand) does not seem feasible to the present (entirely unsalaried) worker. But the late Dr. J. Z. Powell, and dependable Cass County Historian who, having been himself a physician, often visited this hospital) seems to have found and examined them nearly a quarter of a century ago, and interestedly made from them a note (found by the present writer) to the effect that "Fifty persons" had been buried in the old Longcliff patients cemetery before its abandonment in 1891 and its being supplanted by the "New Cemetery" several hundred yards to the North, near the river." The "Lover's Lane" Route runs south from the "River Road" (passing along side and just west of the New Hospital Cemetery, crosses Longcliff Creek, climbs to the Wabash river's south terrace-rim and passes the old cemetery, descends into a swale, then climbs out of it, finally reaching the East-to-West "Murphy Road" just west of the point where the Pennsylvania Railroad track crosses said "Murphy Road" The Old Longcliff Cemetery is in a very remote portion of the hospital's far flung woodsy campus or grounds; and visiting it (or its vicinity) is absolutely prohibited except on express permit issued by the medical superintendent. Transcription of L'Anguille Valley Memorial Association Reports by Rebecca Miller, February 2007. Logansport State Hospital Cemetery Clinton Twp, Cass Co.